Malaysia's iconic city is an eclectic metropolis with the old and the new living side by side in harmony where you'll find authentic little Malay shophouses nestled between the modern skyscrapers. Culture vultures will love the diversity of the city, but also we recommend that you venture out of the city and explore its beautiful surroundings. Kuala Lumpur or KL as it's often known is one of the world’s fastest growing cities. Malaysia’s capital city is a diverse hot-pot of culture, business, historical heritage and ethnic diversity. With a whole host of visitor attractions, beautiful scenery, great shopping and interesting history, Kuala Lumpur has emerged as a popular and safe tourism destination. Home to some of the tallest skyscrapers including the Petronas Twin Towers and with a booming commercial district, Kuala Lumpur has helped to make Malaysia one of the leading economies in South East Asia. There's a great choice of European and Far Eastern Airlines which fly to Kuala Lumpur from the UK, If you prefer direct flights, Malaysia Airlines and low cost airline Air Asia X are currently the only carriers flying directly from the UK. Situated in the heart of South East Asia, Kuala Lumpur has a superb transport network which is served by scheduled airlines from all over the globe. It has also attracted a growing number of low-cost airlines such as Air Asia and Tiger Airways. Kuala Lumpur is the ideal gateway to explore Malaysia and nearby Singapore as well as the rest of South East Asia, it is also very popular as a stopover en route to Australia and New Zealand. Kuala Lumpur offers a heady mix of ancient temples, modern architecture, street markets, 21st century shopping malls and a vibrant nightlife. 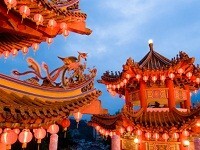 Its influences of native Malays, Indian, Chinese and British colonials make for a very interesting blend of attractions. Take in the city views from one of the towering skyscrapers such as Menara KL Tower or the Petronas Twin Towers, admire one of the world’s best collections of Islamic art at the Islamic Arts Centre, explore the many mosques and temples (Hindu, Buddhist and Muslim), relax at the stunning Lake Gardens Park with its exotic wildlife and tropical jungle or get up close to the magnificent elephants at the Elephant Conservation Centre. Here at Directflights.com, our mission is to find you the most competitive prices on flights to thousands of destinations across the globe. To find the cheapest flights to Kuala Lumpur, Malaysia, we recommend that you avoid travelling during the busiest times of year such as Christmas and the school holidays and to book in advance if at all possible. As well as finding you a great choice of cheap flights, we can also assist with searching for the best deals on lastminute flights to Kuala Lumpur, Malaysia. KL has a very tropical climate that is often hot and humid with an average daily temperature between 28˚C - 34˚C. With a high humidity KL does receive a fair amount of rainfall but most of this occurs during the southwest monsoon season, between September and April – rain can be blessing in KL as it brings the temperature down a few degrees.